As thousands of Perth locals’ lace up their running shoes in the lead up to the annual Chevron City to Surf for Activ fun-run, it is important to play your journey ahead. With multiple road closures in place and large crowds, vehicle access will be limited. Don’t forgot to collect your race pack from Lords Recreation Centre, Subiaco before you head towards that start line. Present your e-ticket to collect your race bib on Friday 24 August between 7.30am and 7.00pm or Saturday 25 August between 8.00am and 5.00pm. Forget parking and catch complimentary public transport using your e-ticket! You can get to Lords by jumping on the Fremantle train line and taking a short walk from either Subiaco station or Daglish station, or catch bus route 28 between Perth bus port and Claremont station, exiting at Hay Street. 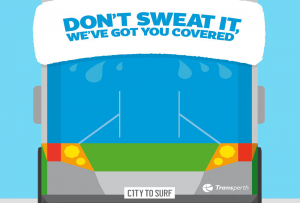 Don’t sweat it before hitting the track, Transperth have got you covered! Included with every registration is free public transport to and from the start and finish precinct on Sunday August 26. All you need to carry with you is your e-ticket or wear your race bib while using public transport, these will be distributed 20 August. All participants can access transport three hours before go time, during the race and three hours following official race completion. Train lines will be open for the duration of the event, providing easy access along the Joondalup, Mandurah, Armadale, Thornlie, Midland and Fremantle lines. Waiting at the finish line will be dedicated shuttle buses ready to transport runners from the finish line to McLean Park, Floreat Forum and the Perth bus port from 8.30am onwards; and to Stirling Station starting from 9.00am. For more information go to the Transperth Journey Planner. For all 4km walkers, runners, rollers and supporters, limited parking is available at Floreat Forum in exchange for a gold coin donation. From here, a shuttle bus service runs every 15 minutes to and from the finish precinct. If your taking on the 12km, 21km or 42km courses starting in the City, you can take up an exclusive Chevron City to Surf for Activ deal with Wilson parking. Book an all-day parking spot for $5.50 at either Barrack Arch Car Park or Queens Complex Car Park through Book A Bay, simply use promo code CITY18 to get in on this deal. Roads connecting Perth CBD to City Beach will be closed from 1.00am to 2.00pm. The CBD is expected to re-open around 7.45am, with main roads including the Mitchell Freeway Riverside Drive exit, Mounts Bay Road exit; Kwinana Freeway/Mounts Bay Road exit, and Mounts Bay Road/Hackett Drive exit closed between approximately 5.00am – 8.10am. Finally, West Coast Highway and Oceanic Drive to Challenger Parade (south) will be closed off to the public from approximately 7.00am – 12.40pm. Check your route on the interactive road closure maps. If you are in Perth and up for a bit of fun-raising, we encourage you to take part and get active for Activ. Online registrations to the Perth event are open until 12pm midday Saturday 25 August, register now.